Soil Recipe-7: Panchagavya, the magic begins with this spray! 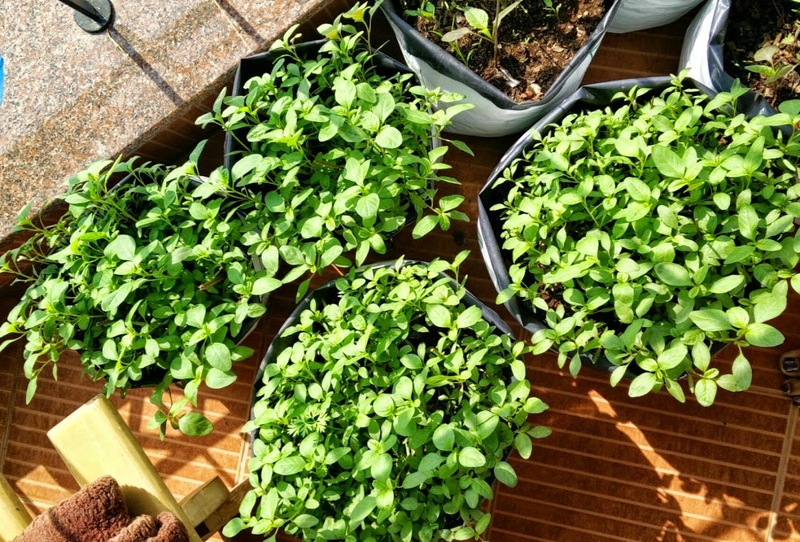 There maybe many kinds of soil recipes, but the most preferred one amongst urban gardeners is Panchagavya. So much so that this solution is sold in the market by various companies and is a common remedy prescribed by seasoned gardeners. Similarly, there maybe many variations of Panchagavya recipe available depending on the type and proportion of the ingredients used. What is being presented here is the one which has been verified by experienced organic farmers who apply this amazing and cost-effective solution to both small and large agricultural lands. 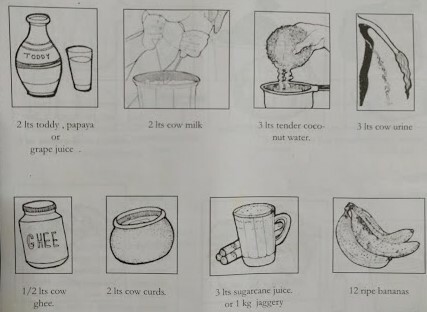 For preparing Panchagavya, we need a wide-mouthed mud pot, concrete tank or plastic cans. Put the fresh cow dung, cow ghee and sugar cane juice or jaggery into the container and mix thoroughly twice daily for four days. Cover it with a wet cloth to avoid drying up of the mixture in shade. On the fifth day, add the rest of the ingredients and stir twice daily for 15 days. The Panchagavya stock solution will be ready after the 20th day. It should be stored in the shade and covered with a wire mesh or plastic mosquito net to prevent house flies from laying eggs and the formation of maggots (worms) in the solution. If sugarcane isn’t available, add 1 kg of jaggery dissolved in 3 litres of water. Likewise, if toddy isn’t available, add 100 grams of yeast powder and 100 grams of jaggery to 2 litres of warm water. After 30 minutes, add this solution to replace toddy. Another method is to take 2 litres of tender coconut water + 100 grams of jaggery and keep this in a closed plastic container for 10 days. After fermentation, it becomes toddy. This solution can be prepared beforehand and used to replace toddy. When stirred twice daily, the Panchagavya solution can be kept for six months without any deterioration in its quality. 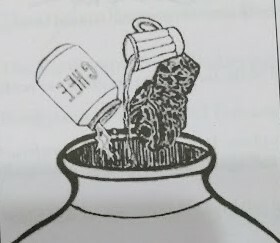 Whenever the solution becomes thick due to evaporation of water over a long period, suitable quantity of water can be added to keep it in a liquid state. 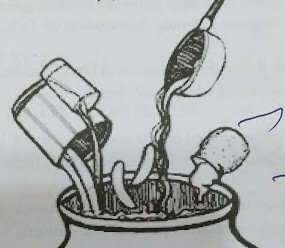 Unfortunately, the ‘Soil Recipes’ has only described the preparation method, whereas application of this solution and its benefits are missing from the manual. 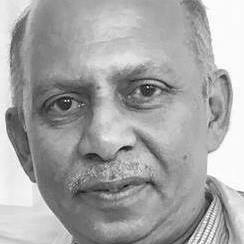 Interestingly, all that it took was to call up Bangalore-based eco-warrior and organic farming expert Soil Vasu who has, so far, helped organic farmers prepare Panchagavya at least 1,500 times. Accordingly to Vasu, Panchagavya has to be diluted down to 3 percent before application. For example, for every 10 litres of water, you can add 300 ml of concentrated Panchagavya. To begin with, this solution must be used for seed and sapling treatment. Seeds have to be soaked in the diluted solution for five minutes and dried in shade before sowing. In case of saplings, the tender roots of the saplings must be inserted in the solution for 15 minutes before planting. This technique takes care of all the seed- and soil-borne infections and offers immunity at the initial stage itself. Similarly, spraying Panchagavya 10 days before harvesting can have a magical effect on the size of the leaves and fruits and their taste and quality, adds Vasu. 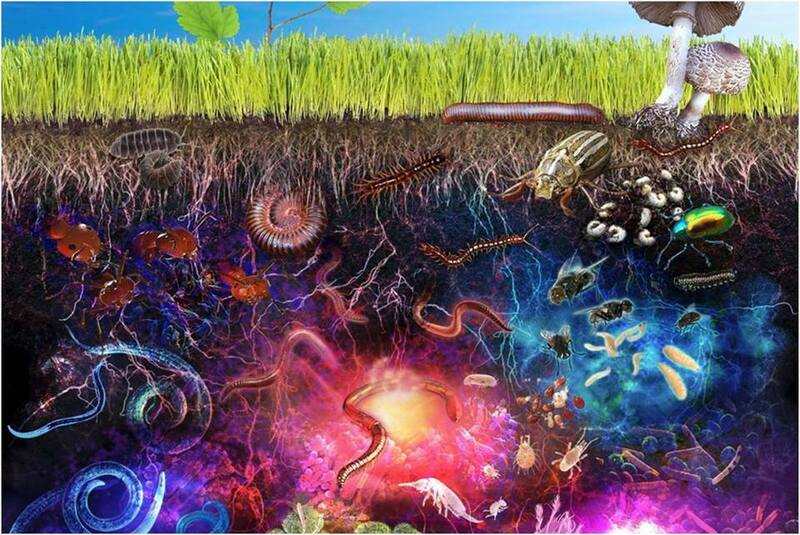 (Source: Soil Vasu) The amazing world beneath the surface. Soil Vasu can’t simply stop with one. From immunity point of view, he says apart from being a nutrient, the ghee added to Panchagavya also makes the leaf and stem surface slippery. 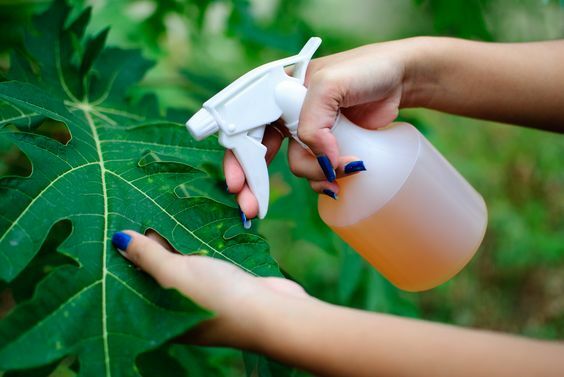 This ensures less evaporation of moisture from the foliage and secondly, eggs of the disease-causing insects fall off from the slippery surface if Panchagavya is sprayed thoroughly on both ventral and dorsal sides of the leaves. When applied to the soil, this solution increases its porosity and helps soil micro-organisms flourish like never before. The plants get all the important micro- and macro-nutrients to remain strong and healthy, no matter how adversarial the conditions get. The roots grow stronger and deeper. The branches multiply and begin to bear more flowers and fruits. The stalks and stems become hardier and can withstand all inclement weather patterns. Photosynthesis is at its maximum due to the broad foliage. The leaves are able to absorb the sunlight with greater efficiency and begin to accumulate high chlorophyll content. When we consume such leaves, Vasu says, the sunlight energy gets passed on to us naturally. The shelf-life of this solution is six months and to keep it in usable condition, it needs to be stirred at least twice daily to ensure the microorganisms keep multiplying in the container and the quality remains intact. 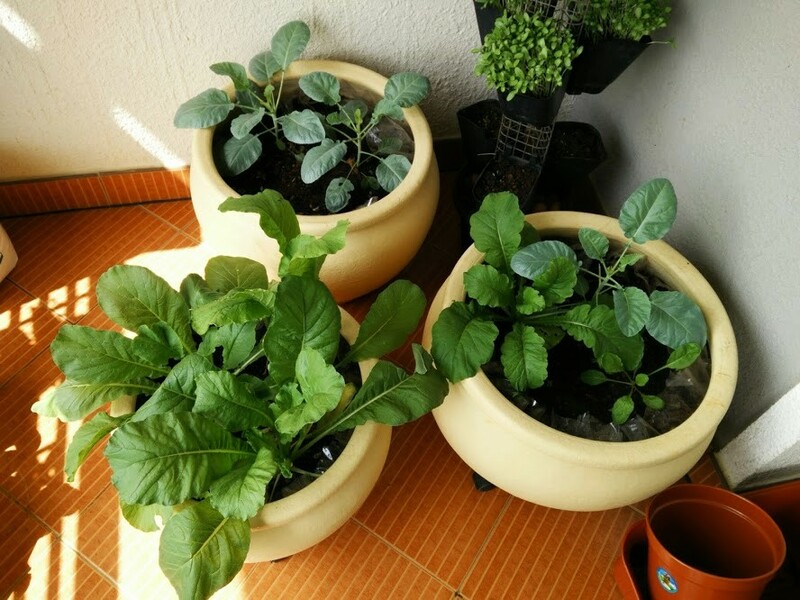 This entry was posted in Organic Gardening, Soil Recipes and tagged organic gardening tips, panchagavya preparation, panchagavya recipe, Soil Recipes by Isa Alvares, urban terrace gardening tips. Bookmark the permalink. Toddy! Hic! Where do you find it? Thank you for your explicit and complete instructions and for suggesting us alternative ingredients too too. Hi, I read the soil recipes provided in this page. They are very useful. Can you also please advise on some remedy to get rid of aphids and mealy bugs which are badly affecting my brinjal, ladies finger, etc.? Article above does not mention quantity (weight or volume) of Cow dung – will the article be updated? Yes, somehow missed it. Will check and get back to you. Sorry about it.
? No, just keep up the good work.